Jesse Kriss is a designer, programmer, and musician living in Cambridge, MA. He works on projects at the intersection of art and technology, including a visualization of the history of sampling, and MaxLink, a free software package for connecting Max/MSP and Processing. 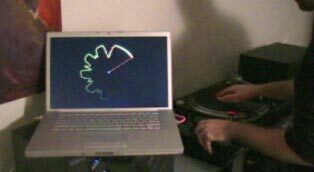 His “Visual Scratch” system uses Ms. Pinky along with Processing, Max/MSP, and MaxLink to create a realtime visualization of scratch DJ performance. 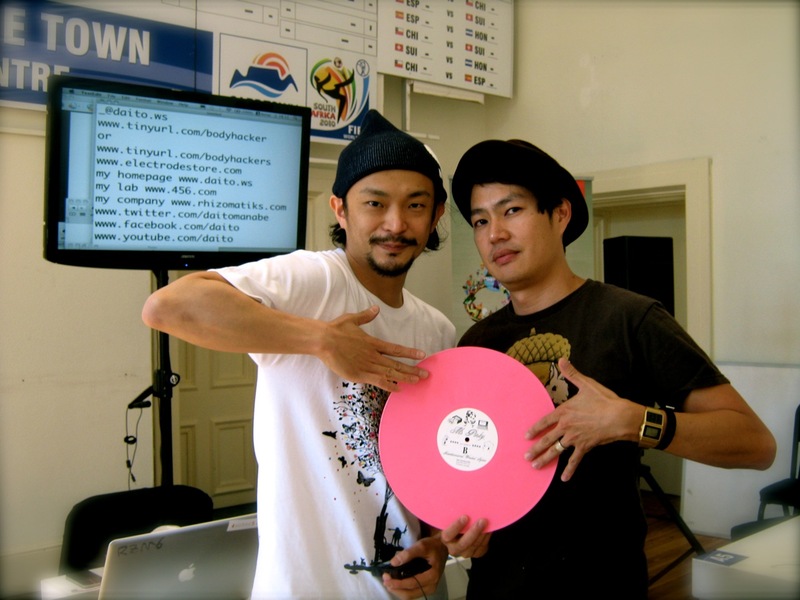 Daito Manabe is from Tokyo, Japan. Born in 1976, he received the Bachelor of Mathematics from Tokyo University of Science. After working as a systems engineer and programmer, he graduated from the International Academy of Media Arts and Sciences in 2004, and went on to be an instructor in the Department of Inter-Media Art at the Tokyo National University of Fine Arts and Music. Daito is an internationally performing Turntablist and Sound Artist whose work focuses on surround/oscillation/super-low-frequency technology and explores sensual peculiarity, commonality, and interaction. Daito gave a comprehensive hands-on workshop about the use of Max/MSP/Jitter and Ms Pinky. Click here to see a short video from this historic event. Here’s Daito jamming on a custom system he created for audio/visual turntable performance using MsPinky + Max/MSP/Jitter. Please visit his website and his youtube channel to see the numerous other projects in which he’s involved. Mr Sakitumi is from Cape Town, South Africa. On his days off he is also known as Sean Ou Tim. An internationally performing musician, beat maker, and multi-instrumentalist, he has played in many prominent South African bands such as Lark, Goldfish, Freshly Ground, and Max Normal (with the artist now known as Ninja who eventually went on to form Die Antwoord). 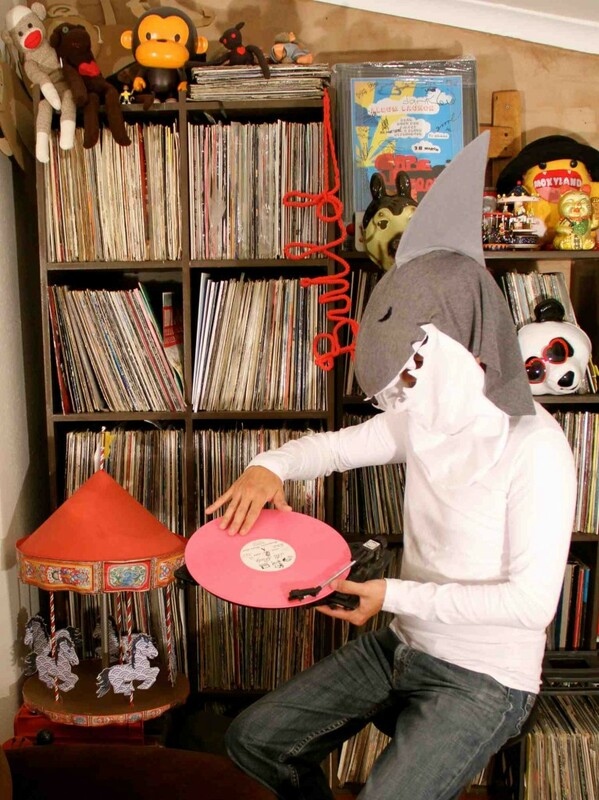 He performs with Ableton Live, FX, and bass guitar, using Ms Pinky for both audio and visual scratching. Have a look at their youtube AV mashup page www.youtube.com/krushedandsorted . Be sure to check out his upcoming debut album– soon to be released on African Dope Records. For more information, watch the video interview. Mr Sakitumi + Ms Pinky = Mr Pinkytumi!